New 15TB HDD provides more storage per server rack. In an effort to provide data centres with more storage per server rack, Western Digital has announced its new 15TB Ultrastar DC HC620 host-managed SMR HDD which is the highest capacity drive ever created. The new HDD delivers an unprecedented capacity point with a time-to-market advantage for customers that have already invested in the benefits of Shingled magnetic recording (SMR). Western Digital's new HDD sets the bar for TCO and is well positioned for hyperscale cloud and traditional data centre workloads. The Ultrastar DC HC620 could also be used in smart city initiatives for video surveillance, storage for regulatory compliance and big data storage. The new HDD also enables the world's densest server and storage systems. By using 15TB HDDs, a company could fill a 4U60 HDD enclosure to reach a raw storage capacity of 900TB which is an additional 60TB per 4U rack. In an at-scale environment where floor space, $/TB, TB per square foot, or watts per terabyte are critical, the TCO savings from Western Digital's latest HDD could be significant. 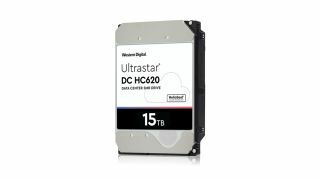 The Ultrastar DC HC620 is based on the company's HelioSeal platform and serves as an extension to its 14TB SMR line of HDDs released last year.